Hate crime or terrorism? Lone wolf or extremist? These words are often used to describe ideologically motivated violence in the U.S., and their use by officers of the law and members of the media has impact on real cases. ISPU’s new Equal Treatment? report compares media coverage and legal treatment when the perpetrator of an act of ideologically motivated violence is perceived to be Muslim vs. not perceived to be Muslim. Join Equal Treatment? co-author Kumar Rao and Rutgers CSRR Director Sahar Aziz as they discuss what this data means for Muslims in America. 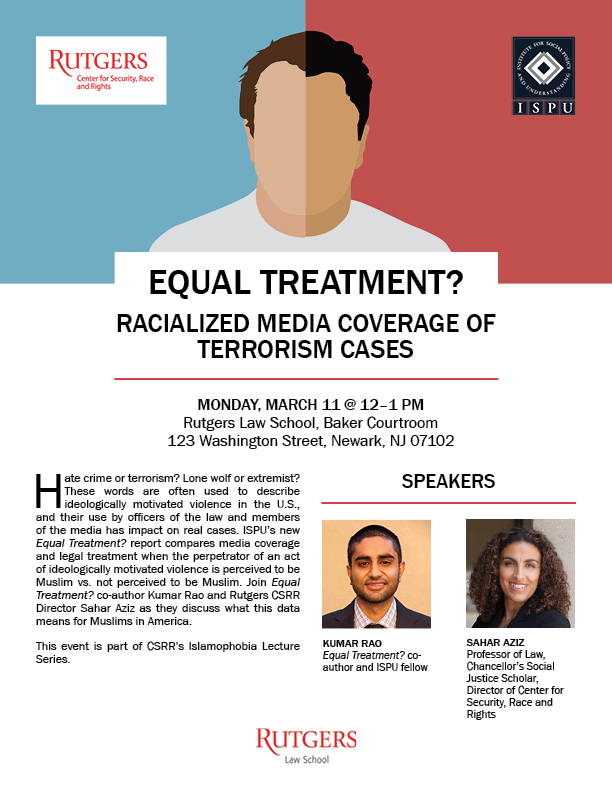 This event is part of CSRR’s Islamophobia Lecture Series. If you cannot attend the event, you can watch via livestream at this link.